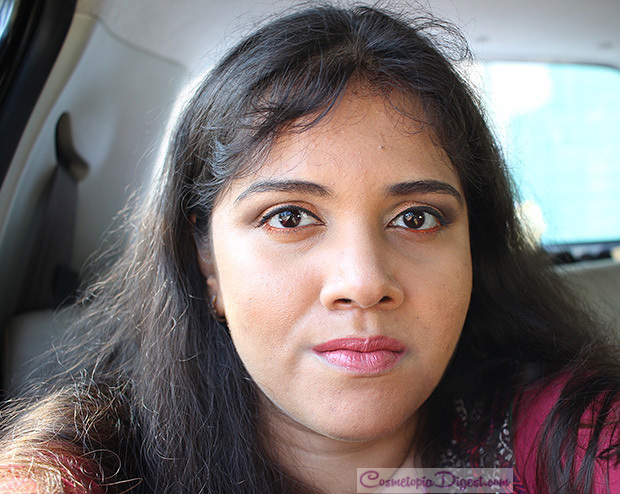 Caramel eyeshadows, a pop of eyeliner and dusty rose lipstick are my go-to this Spring. What with the Cricket World Cup and a round of Spring-cleaning, I haven't found the time to blog over the last few days. My desk, floor and bed are strewn with the evidence of my cleaning-spree, the scorecards and the euphoria/disappointment experienced during the matches. On the bright side, my cupboards are all clean and bare and the World Cup ends this weekend. I wanted to do a look with the caramel and orange-ish eyeshadows in the Too Faced Semi-Sweet Chocolate Bar palette (reviewed and swatched here) as soon as I got the palette. I had an orange eye pencil from a Memebox that paired nicely with the eyeshadows, and then there was a new bronzer to try out. This post is the result. 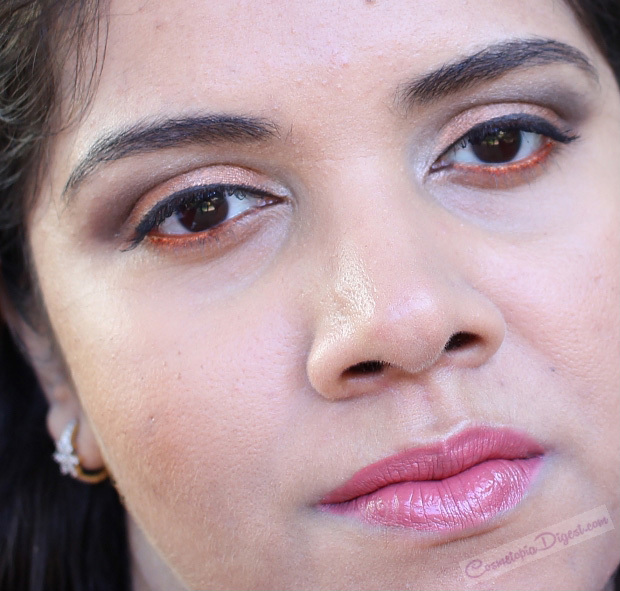 Here is a sunny Spring makeup look with caramel eyeshadows and a pop of orange, featuring Bourjois foundation, Physician's Formula Argan Bronzer and Too Faced Semi-Sweet Chocolate Bar palette. This is the look. Ignore the frizzy hair. I stopped blow-drying and heat-styling sometime last year and the frizz is a billionth of what it used to be. And my hair breaks less and grows faster. There's a close-up shot further below. I wanted my eyes to look caramel-ish and orange without being unwearable, so I picked Caramel and Bon Bon from the Too Faced Semi-Sweet Chocolate Bar palette, swatched here, as the primary eye colours, and used a Makeon orange eyeliner pencil in the lower lashline, for a pop of orange. See the scar on the bridge of my nose? I love it now, though it involved a classmate sharpening a pencil with a pen-knife and a curious yours truly - and some furious adults (at me for "poking my nose into other kids' business") - in the kindergarten. Who gave the kid a knife?? I used a light dusting of "Licorice" eyeshadow from the Too Faced palette on the eyebrows. I know I should have gone for something more terracotta, such as NARS Audacious Jane, but I'm a dusty rose/mauve lip person, no matter what. Meet my new HG dusty mauve - Bite Beauty matte creme lip crayon in Glace. If you like subtle lipsticks and don't have this yet, believe me, you NEED it! 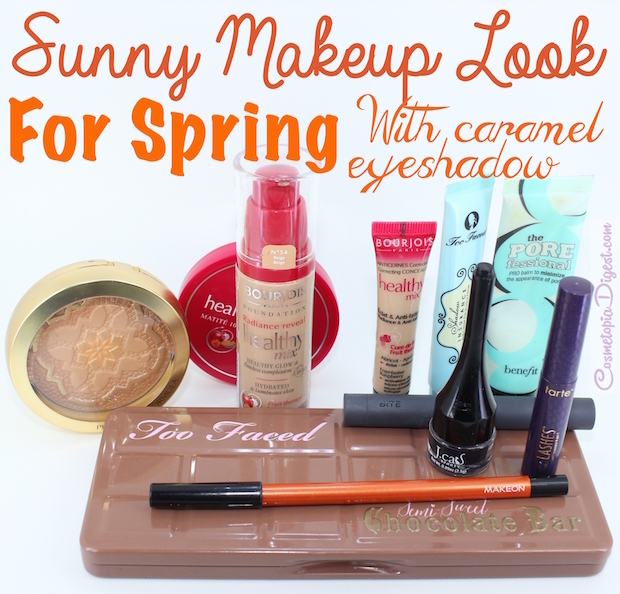 Do you have a favourite Spring makeup look? What is it like? Tell me in the Disqus comments widget below.